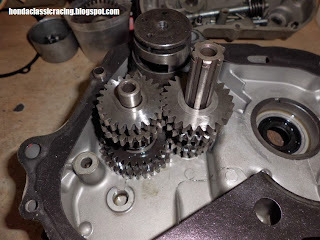 On paper the standard C110 gearbox is pretty close, nicer then any standard OHC gearbox, but while riding I felt the step from 3rd to 4th was a bit tall, so for the racebike I was wondering if anything could be done about that easily. 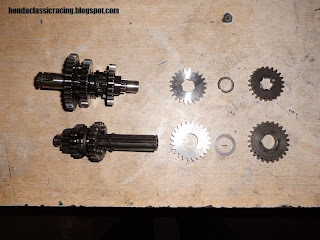 I have a lot of ratio's on paper of different gearboxes, so looking at OHC models, which have the same distance shaft to shaft and a similar 4speed system I found another gearbox with a shorter 4th gear that might just work in a C110. I had a look through my leftovers of various gearboxes and came up with an SL70 4th gear what would be my best bet. 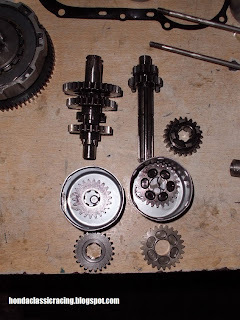 An SS50 4th gear could also be used, but then I would have to remove more material from the 3rd gear for it to work, and I didn't want to take off too much. 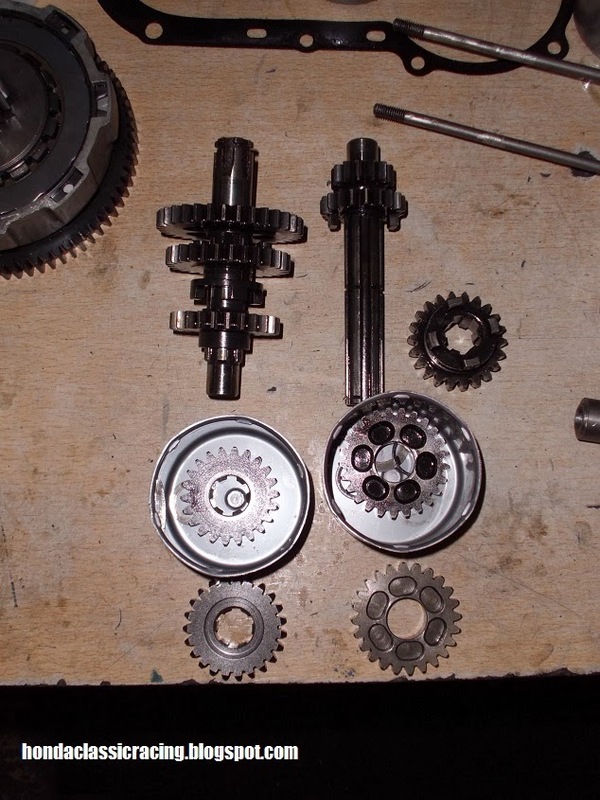 Seen here the original C110 gearbox with the parts to modify taken off, and on the bottem the new 4th gear, which is too wide to fit in a C110. To make the SL70 primary 4th gear work, I had to take off a little bit from the 3rd gear cogs so they would slot into 4th. 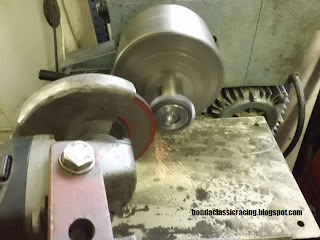 So it went on the lathe with the anglegrinder attachment. After that, it's time to narrow the SL70 primairy 4th gear, again, grinding it on the lathe. 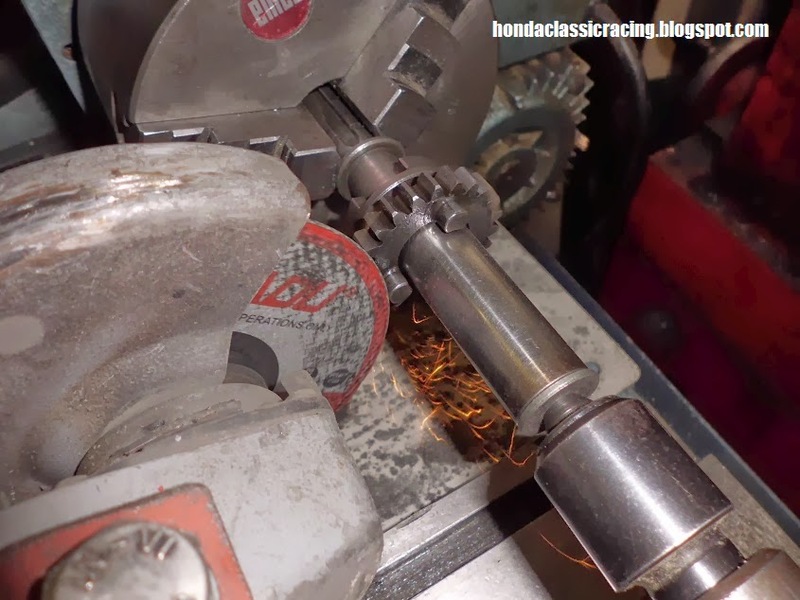 Same was done the the secundairy SL70 gear, and after that a lot of cleanup to get the lathe free of all the grinding dust, including taking the chuck apart and cleaning the insides. And a quick pic mounted in the engine. Now I really want to finish the engine and get the rolling chassis done so far that I can feel what a difference this 4th gear makes. Theoretically it should make the step from 3rd to 4th about 40% smaller. That is very cool! I enjoy the updates on your raced. Where do you get your crankcase gaskets from? I've not been able to find any that are the same as the original for the C110, even using what I think is the correct Honda part number. Gaskets came from eBay or CMS, there are different ones for the C110, but as far as I've seen they all fit on all the slightly different cases I have, unlike an S90 engine. I've used CMS as well, but I don't think my parts list is the right one for my year of C110. Do you know the part number for that gasket? My crankcases look the same as yours. Thanks.